The Iraqi government kills over 3000 Assyrians in the village of Simele. 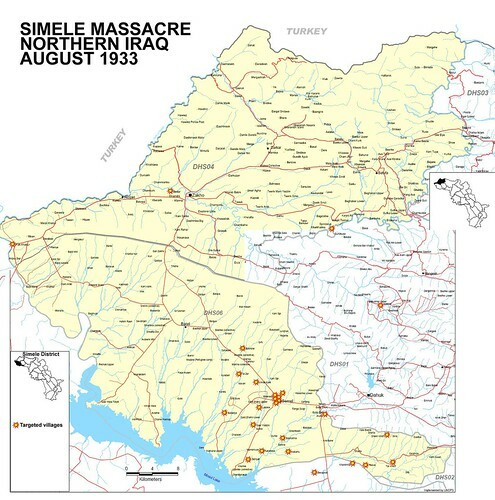 The Simmele Massacre of Assyrians occurred between August 7 and August 11, 1933, in the town of Simmele, North Iraq, and its surroundings. It was carried out by the Iraqi Army, led by General Bakir Sidqi, a Kurd, and Kurdish and Arab irregulars. The number of victims has been subsequently determined by researchers to be 3,000, since the massacre was not confined only to the village of Simmele. Simmel is on the main road to Zakho, about eight miles from Dohuk, under the administration of which qodha it came. It was the largest village in the neighborhood and consisted of over one hundred Assyrians and ten Arab houses. The total population would have been about 700, most of the Assyrians belonging to the Baz tribe, with others of the Upper Tiyari and the Diz. The headman was a strong supporter of the Mar Shimun and with fifty others had followed Yacu into Syria. These fifty were almost entirely Tiyari, hardly any of the Baz being among them. The feeling of unrest in the village increased. On August 8th the Qaimaqam of Zakho appeared with a lorry full of soldiers. No satisfactory answer has yet been given to the question why he should have come with troops into a district that was outside his administration. He entered the village and told the Assyrians to surrender their rifles, as he feared that fighting might occur between the rebel Assyrians and the Government forces, in which case the people of Simmel would be less likely to be involved if they had no rifles. Plausibly, but with lies in his heart, he assured them that they would be safe under the protection of the Iraqi flag which flew over the police post for Simmel, being a large village, had a police post of one sergeant and four men. The Assyrians then handed in their arms, which were taken away by the troops. The building of Mauthausen concentration camp begins. The Iraqi government kils over 3000 Assyrians in the village of Simele. The day becomes Assyrian Martyrs Day. George Washington invokes the Militia Acts of 1792 in order to suppress the Whiskey Rebellion in Pennsylvania. The Iraqi Government slaughters over 3,000 Assyrians in the village of Sumail.